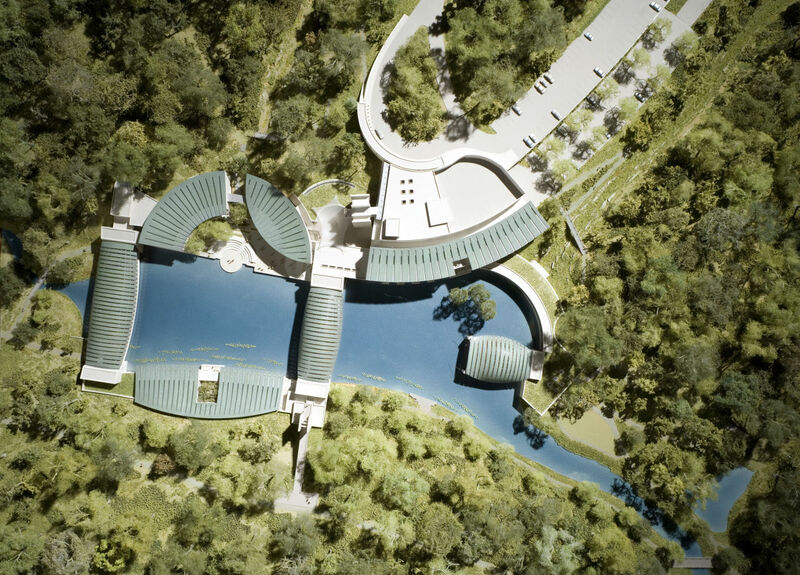 When finished, the Crystal Bridges Museum of American Art will provide visitors with multi-faceted enjoyment. 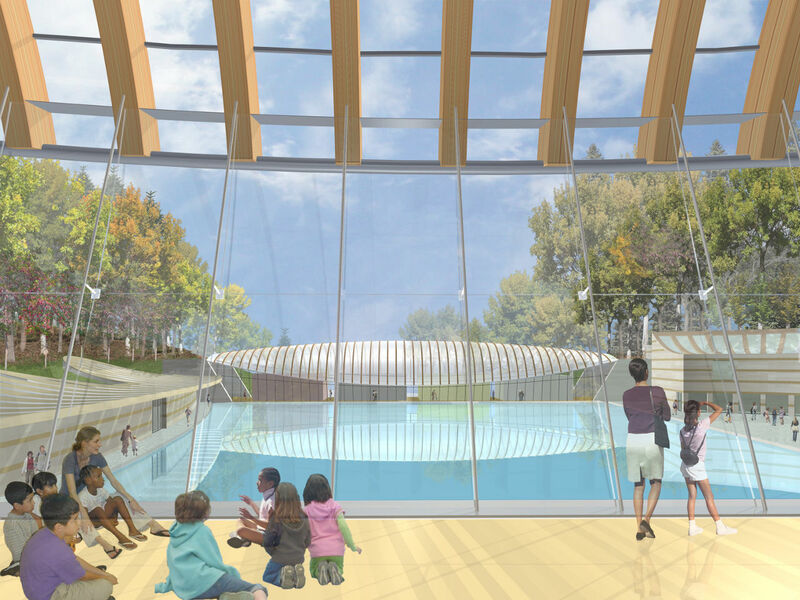 “The water features are intended to give an alternate experience to the art exhibits,” says Hugh Phillips, R.A., the project manager and a principal at Safdie Architects, the Museum’s architectural design firm. 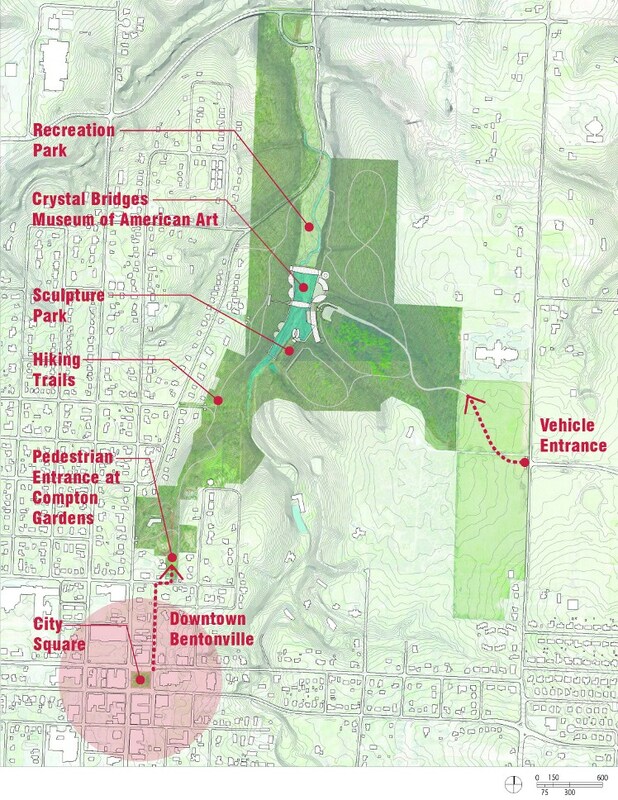 “We had the choice to keep the stream natural with its frequent low flow or to construct ponds and provide a larger body of water to make the water more significant.” Although both were good choices, given the natural beauty of this narrow valley about a mile northeast of downtown Bentonville, Arkansas, Safdie Architects elected to go with the larger water feature. In most of the Crystal Bridges Museum buildings, when visitors are looking at art, they are not seeing water. However, as visitors move between the exhibit galleries, “the water features give them something to focus on, a break between art viewings,” says Phillips. Part of the architectural concept is that the water is close to the visitor, not deep down in the valley. “The surface [water] needing to be so close to the finished floor resulted in challenges for the site design,” says Brent Massey, P.E., vice president of operations at Bentonville-based CEI Engineering Associates, Inc. and project manager for the site design. “The water passing under the building could not be more than 7' (2.1 m) below the finished floor. Yet we had to pass major storms over an elevation control weir in less than a 4' (1.2) opening under the building.” This increased the risk of water damage to the two buildings that spanned the creek. 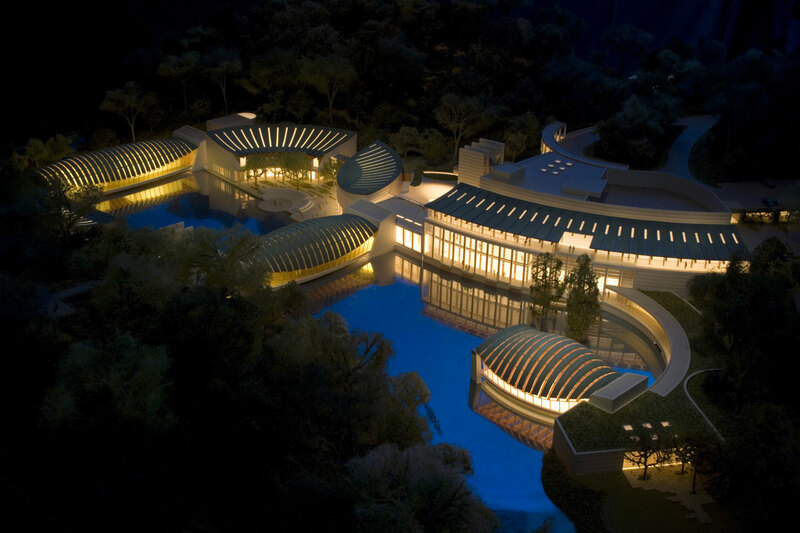 Therefore, to better define the risk and verify that flood passage is acceptable, Crystal Bridges Museum management decided to engage a specialist to conduct a computational fluid dynamics (CFD) study of the two buildings and the ponds. The CFD results confirmed the adequacy of the design. During dry months, the creek and nearby Crystal Springs go to very low or no flow. 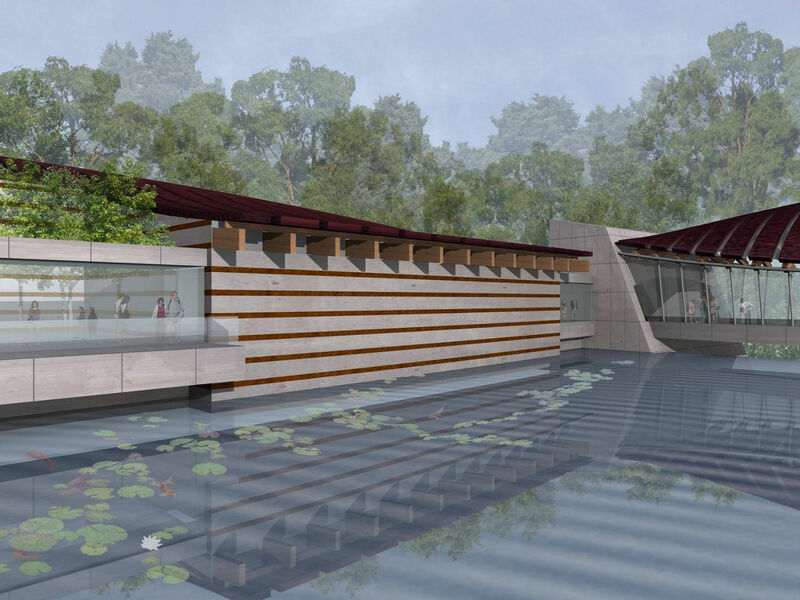 “As a result,” Massey says, “the project includes two on-site wells to provide makeup water to keep the ponds full.” A recirculation system is included to keep the water moving while disguising the system from museum visitors. Because the stream valley has some characteristics of a typical Arkansas “losing stream" (i.e., an influent stream or a stream bed with fissures and ways for surface water to move quickly into the ground), it was decided to provide both ponds with an impermeable liner system. This means having mechanical equipment on top of the liner, which requires protection of the liner. Pond edges are also provided with rock armoring, to both control erosion and provide a pleasing appearance. The same wells that provide makeup water also provide wash water. “Right now the design does not include fixed bar racks or other means to trap larger debris,” Massey says. “This is under consideration as a late design addition or even as a post-opening modification, should experience show it’s needed.” Pond construction is just about to get started, that area having been in use as a construction staging area until this point. 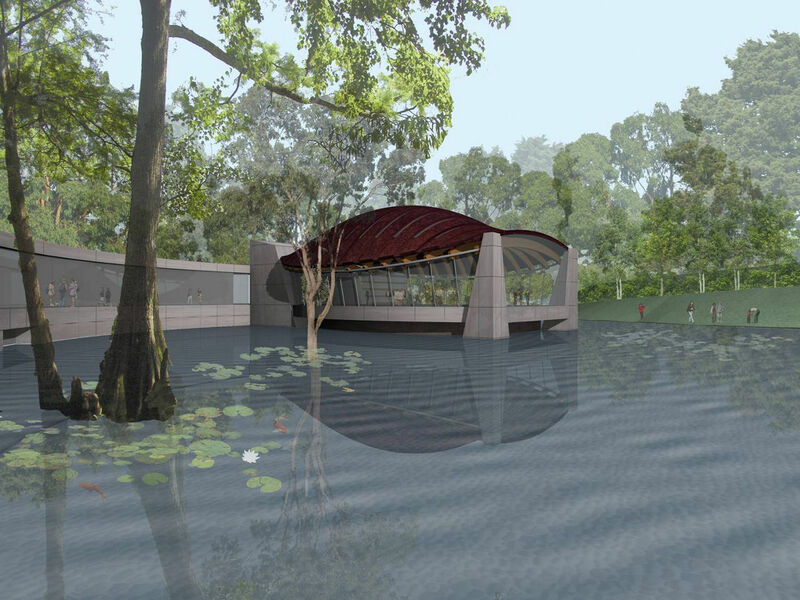 Through all of this, the Crystal Spring, from which the museum gets its name, will continue to contribute water to the stream ahead of the upper pond. The spring has been maintained in its natural, pre-project condition. It will not be visible from the buildings, but a nature walk on the grounds will provide visitors with yet another type of experience. Just as the engineering and architecture work together to provide the Crystal Bridges Museum buildings and water as dual experiences, so do they allow the natural beauty of the valley to come through.